One of my favorite gifts to give (and receive!) 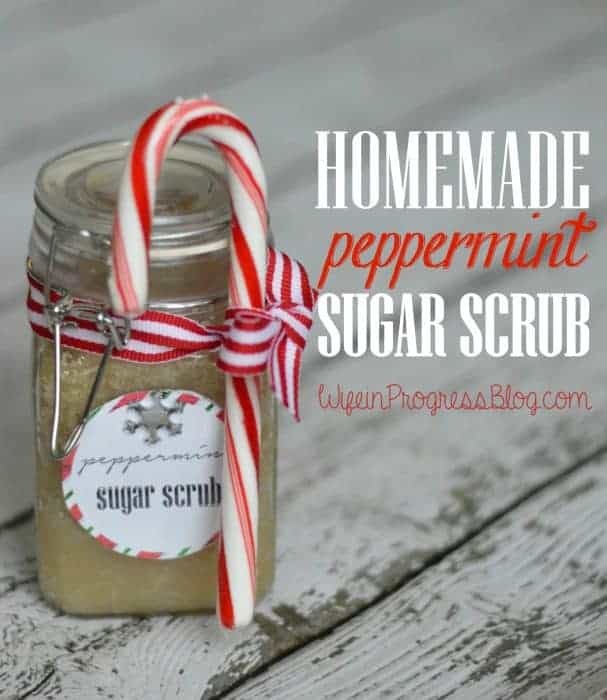 is this beautiful DIY peppermint sugar scrub. Loaded with coconut oil and organic sugar, they will revive flaky winter skin and bring back a glow. You can add any scent of essential oil but for Christmas I love to add peppermint which smells divine in a hot shower! This sugar scrub recipe can be made in a few minutes and will surely be loved! It will take you 5 minutes to make a batch of this simple handmade sugar scrub and another 5 minutes to decorate the container. I’ve included downloadable labels for you so that you can recreate what I’ve done. I just printed them up, cut them out and glued them on. Don’t forget to download the labels that I’ve created. The small ones directly below fit on both the top and the front of the small containers that I used. I also created labels that fit on small and larger mason jars. For the final touch, I wrapped some striped ribbon and a candy cane around the neck of the jar and stuck a snowflake sticker on. Mix the oil and sugar together. Add 12 drops of peppermint essential oil (therapeutic grade) and stir. Pour into a mason jar or other glass container and decorate. That’s it! That’s all you need to make a delightful batch of peppermint sugar scrub! Hi Jenna! Thank you so much for sharing at What to do Weekends party with us. I am featuring you tonight on the blog. Congratulations! I love DIY sugar scrubs. This recipe would make a lovely little holiday gift! Pinned and sharing. Thanks for joining us at Family Joy Blog Link-Up Party! I can not get enough of sugar scrubs, especially in the winter when my skin gets so dry. This one looks divine! I can not wait to try it! Also, the labels are perfect for the packaging. Such a great gift idea that I’m sure any woman would love to receive. Thanks for sharing! This looks wonderful, and what a great gift idea! I especially like the tags. I was just trying to think of something to give my friends this year that I can make myself – and this is perfect! These glass jars are adorable and I love the extra touch of the candy cane. Thanks for sharing! Thanks Tiffany! Your friends will love these! This is so cute! I love giving handmade gifts! Great idea! Ohhh I would so love to receive this as a gift *hint hint to all my friends who love to DIY gifts ;)* the printables are really cute as well, thanks a ton for providing those! 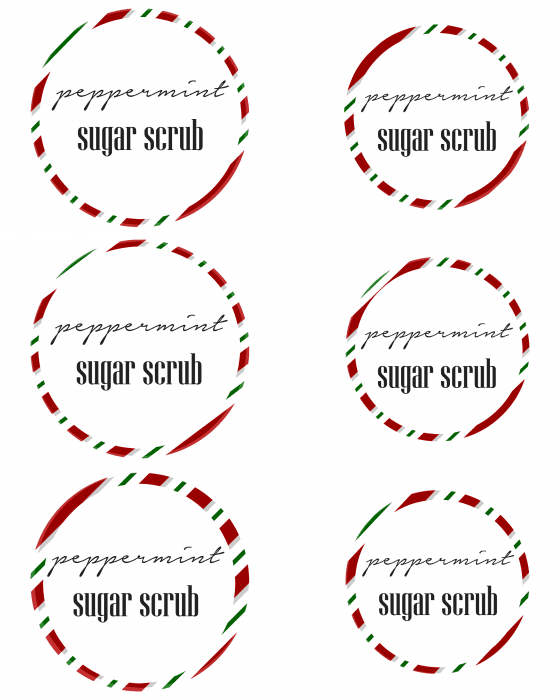 The jars you chose are also way cute and I like the detail with the candy cane! Thanks!! I decided to keep one for myself and my skin has never felt so soft. Definitely makes a great gift!! I love anything and everything peppermint! It smells and tastes oh so good. This is such a great gift idea too! I would love to make these as party favors. That’s a great idea, Teresa! I bet you could find even smaller jars that would be perfect as favors. 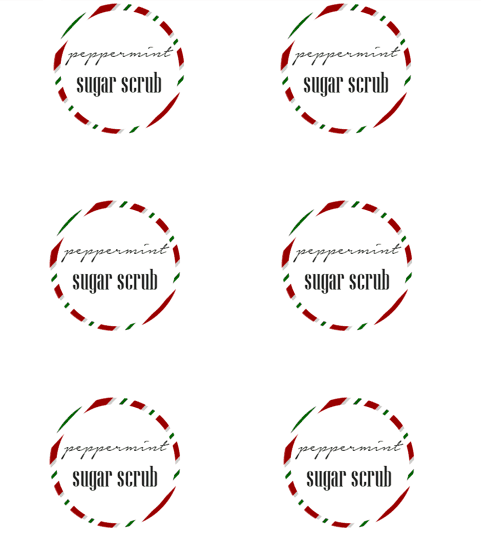 I think this sugar scrub is fantastic and seriously want to make some jars and pass them out too. I was just thinking last night how girls and women love to get this kind of gift for Christmas.